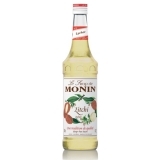 Monin Melon syrup in stylish 70cl glass bottle. This syrup offers the true, juicy essence of Cavaillon melons with a ripe aroma and sweet, fruity flavour. This particular melon comes from France, in the well-known region called Provence. Grown on famous south of France sunny slopes, the delicate and juicy taste of Cavaillon melon will ideally flavour your cold, chilled beverages or even your smoothies. Add a dash of Monin Melon syrup into your drinks and get a refreshing authentic melon sensation. Colour: Light gold with pink glints. Taste: Cavaillon melon smell, sweet and juicy ripe melon taste. Applications: Cocktails, sodas, lemonades, fruit punches, teas. Sugar, water, concentrated melon and other fruit juice, flavouring, colouring agents: caramel E150b, E163. Total fruit juice: 27% including 16% melon juice. Please note: Not compatible with cold milk, steamed milk, coffee, or chocolate.